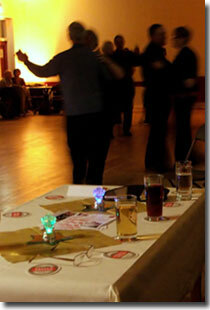 Not Strictly Ballroom - Ballroom Dances to enjoy! We create a social dance evening that every one can enjoy. We have a mixture of Ballroom, Latin and some fun dances plus maybe a couple of easy to follow sequences. ...and all to upbeat music you can enjoy both listening and dancing to! So the evening is suitable for those who can dance a little as well as more experienced dancers. We are not Dance Teachers so do not include any tuition at any of our dances. Private Parties & Weddings Too. Our dances are aimed at an adult audience. Thank You. Waltz, Quickstep, Foxtrot, Tango, Cha Cha Cha, Rumba, Samba, Jive, Which is Your Favourite?